This is a summer of firsts for me… my first full time job, my first international trip, and my first wheat harvest. Living in Kansas (the Wheat State) you would think that I would have been exposed to wheat harvest before, but the Flint Hills region of Kansas where I grew up is more suitable for cattle grazing. The Flint Hills span to cover 9 out of 105 counties that contain rolling hills of shallow topsoil over stacked limestone rock. This land, while rich in nutrients, is inaccessible to farm equipment and the soil is too shallow to grow crops making it perfectly designed for cattle grazing. So the geography of my childhood home was an excusable reason for my limited wheat harvest knowledge, but this past weekend I got the opportunity to see the farmer side of things when visiting my boyfriend’s family near Wichita, Kansas (which is not in the Flint Hills region). To say that I helped with harvest would be an exaggeration… I really just tagged along; however, I did learn how to drive the combine! -Wheat must be below a certain moisture level before being cut (13.5% moisture) and experienced farmers can actually test this by chewing the wheat. Yum! -Most farmers know how to drive a stick shift because all of the old wheat trucks and semis used to haul the wheat to the elevator have manual transmissions. -John Deere is king. No exceptions. -Farmers and ranchers exhibit the same spirit. It is one of harnessing the land’s potential, disregarding an 8 hour workday, and having the passion as an individual and as a family to invest in something bigger than themselves. This can only be described as the Spirit of American Agriculture because it is identical to the drive I have seen in producers across the country. It is this spirit that links us to history and generations before us, and it is this dedication that will lead us into the future as we work together to feed the world. So next time you drive through, fly over, or think about Kansas, don’t settle for the generic “flat” description of our state; instead remember those 9 counties of rolling hills and the spirit of American Agriculture. And THANK YOU to my boyfriend Alan and his family for sharing the love of farming with a ranch girl. This opportunity really meant a lot to me. Meghan, I do have to say congrats on making it to your first wheat harvest! We are just getting started on ours, and got set back a day or two by rain. 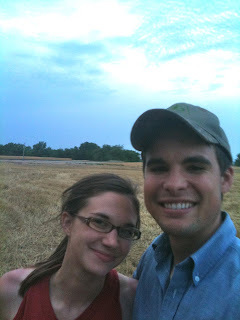 You should check out our family farm blog http://unruhfarms.blogspot.com and see how ours is going! Miss seeing you up at KSU! Love ya, Meg!!! You're such a smartie....you and your man make the perfect farm/ranch couple!! I love reading your mom's blog...keeps me connected to KS, so keep writing!! I enjoyed reading about your experiences during the Kansas wheat harvest. My dad and brother would agree with you about the John Deere machinery, but here on the County Line (http://kimscountyline.blogspot.com), we run Case. Both get the job done. However, if you didn't experience a breakdown or two, you really didn't experience harvest! Keep writing about Kansas farm and ranch life: It's important! You did a good job and I am glad you share the wheat facts with us. One of these days you will want your own blog I agree we run J Deere Green. Way to go Meghan! 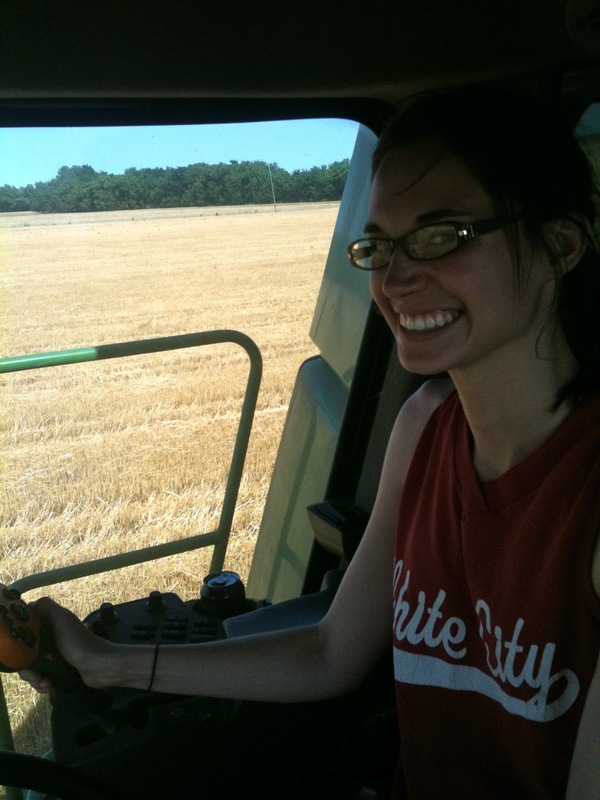 I got to drive the combine for the first time last year. Such a cool experience and thanks for the wheat facts! Enjoyed your blog! Still waiting for wheat harvest in SD. Glad you enjoyed running "the machine"! Great post and great pictures! I love getting any chance to ride along with farmers. Gives me even more appreciation for the work they do. Great blog Meghan. I to get to enjoy the wheat harvest as well as the flinthills. They both are beautiful in their own way. A little John Deere green helps also.